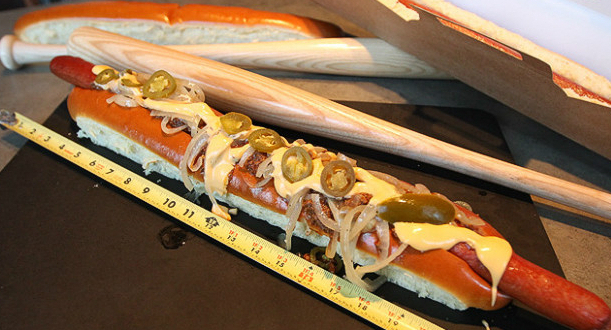 Is ballpark eating now a grotesque indulgence akin to county fair gluttony? American tradition embraces juicy hot dogs and cold, cold beer at the ballpark, but when did a stadium visit become another exercise in over-the-top, self-destructive gastronomy? Joining Anaheim Stadium concessions last year was Melissa's Fresh for You, offering "healthy wraps, salads, fruit cups, hummus and pita chips, gluten-free hot dogs, and gluten-free beer" in four locations. I hear Melissa's black bean burger is scrumptious. My point is that, in my recent stadium experiences, the direction of food concessions has been toward healthier fare, less to conspicuous gluttony. So imagine my delighted surprise when I recently read a headline in my father-in-law's morning newspaper, the Reno Gazette-Journal, touting "Aces Chef to Debut Tasty Treats." Terrific, I thought. Healthier foods at the stadium for the Reno Aces, a popular Triple-A baseball team affiliated with the Arizona Diamondbacks. A ballpark with an actual chef on staff! Delighted surprise until I read the article, that is. Among the new tasty treats? A foot-long hot dog smothered in chili and Fritos. Pretzels slathered with "beer cheese." (Liquid beer cheese? What is beer cheese?) And sweet potato tater tots, deep-fried of course. 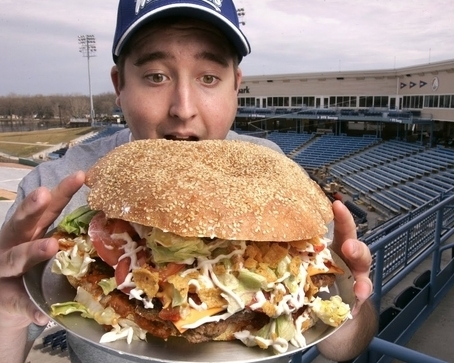 Has ballpark eating become the newest venue of rebellious, indigestion-inducing indulgence akin to county fair in-your-face gluttony as entertainment? If so, shouldn't hungry fans at least be told the calorie, fat, salt, and sugar content of their food options? I believe in freedom of individual choice, yet recognize that in a responsible, safe society, individual freedoms must be balanced with public responsibilities and privileges. In the case of stadium foods and similar, public health concerns must be weighed against individual choice. The fast food industry is required by law to disclose the nutritional content of its menus, so that the public can make informed choices. The time is overdue to also mandate nutritional content disclosures of the tens of millions of meals and snacks sold annually at U.S. stadiums and ballparks. Take me out to the ballpark, but please, tell me what I'm eating.